Extra! Extra! 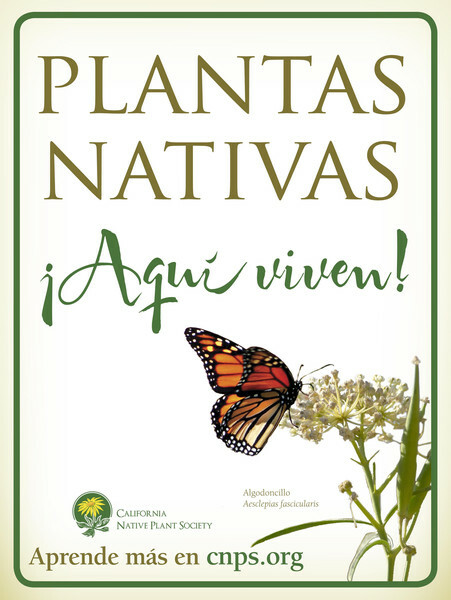 The CNPS “Native Plants Live Here” garden signs are now available en español! Our fantastic new garden signs have gone bilingual! You now have a choice of English or Spanish when you purchase a CNPS “Native Plants Live Here!” sign for your garden! This entry was posted in Miscellaneous and tagged garden sign. Bookmark the permalink. Bueno! That’s great to see!!!! ‘Viven Aqui’ is more acurate. ‘Aprende’ is familiar, whereas ‘Aprenda’ is formal and more appropriate in this case. I’m a native Spanish speaker, completely fluent in English, and a certified tranlator/Interpreter. I’m a CNPS member and would be happy to assist with translations in the future. Thanks, Alba. The president of the Baja Chapter actually provided the translation for us, so he may have felt the familiar tense to be friendlier.